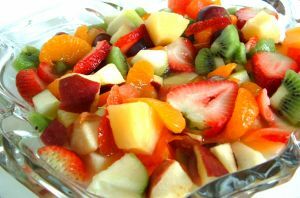 This delicious and amazingly easy fruit salad recipe is the creation of my dear friend and sister-in-law, Linda. Linda is a busy business owner. When she is not traveling, her home is open to the many visitors passing through her small community. Her favorite meals are simple, meet the demands on her time, aesthetically pleasing to meet the demands of her personality, and delicious to boot. Linda is an artist. Her eye for color and texture extends into every area of life that she touches. Her Purim table may be set with bright Fiestaware on a woven cloth in matching primary colors. Shabbos is burnished gold and a shimmering tablecloth. Simple and tasteful~So it is with her cooking. 1. Select an assortment of fruit in season with complimentary colors. Wash, peel and cut fruit into bite sized pieces. There should be 6 to 8 cups of fruit in all. Toss together and refrigerate until one hour before serving. 2. One hour before serving, drizzle on honey and vanilla. Sprinkle cinnamon over the fruit. Toss to coat well. Serve sprinkled with fresh mint leaves if desired.